I listened to Wolf Hall last year and enjoyed it very much. So no need to tell I was really thrilled to receive Bring Up The Bodies for free to review! Thanks again Macmillan and Audiobook Jukebox. A word first on the narration. I had enjoyed a lot the voice of the narrator Simon Slater in Wolf Hall, so I was a bit hesitating, seeing that they had chosen a different narrator for the sequel Bring Up The Bodies. If you have experience with audiobooks for a series, you may have your ear accustomed to associate one character with one voice. After my first dislike on the change, I realized how excellent Simon Vance. He’s so stunning at changing his voice for each character. There are lots of dialogs in this book, with several characters involved, and it is really incredible how the narrator can so quickly switch from one to the other, with a different voice, different tone, different accent sometimes – though I have to say I preferred how Simon Slater had represented the voice of Anne Boleyn and the French ambassador, but these are strictly personal preferences. In Wolf Hall, the author had chosen to designate Thomas Cromwell many times with the simple personal pronoun HE. 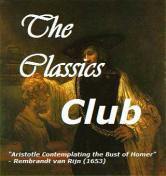 She had received several criticisms for that, as some readers thought it was ambiguous and unclear in some passages. I have to say I never had any problem with that, maybe because I listened to it. Anyway, Mantel listened to the critiques, and in this book many times she specified “He Cromwell.” I found this annoying, maybe particularly because of the audio format. I tell you, you can never please all your readers/listeners! Apart from that, the book is brilliant. It is fascinating to see the evolution between both books: in the first one, Cromwell appears almost like a hero, victim of violence by his father, having had to fend for himself, and done very well at that, suffering the sorrow of losing his wife and many children to the plague – and Thomas More sounding as a total jerk, not at all as the saint canonized by the Church. Well, here things are getting quite more shady. He is very rich, with lots of connection. How does he use these connections? Why does he prefer some people to others? Can he consider the political issues of this country apart from his own personal interests? He looks very calculating, all the time, very cynical as well, going from beginnings to new beginnings that will either benefit him or at least save his head. Is he only inspired by his contemporary Machiavelli (1469-1527)? The book ends with the execution of Anne Boleyn – if you know your British history, this is no spoiler. The whole affair is presented in such a way that the responsibility of her death seems very much the fact of two persons, Henry and “he Cromwell,” maybe even more Cromwell, as you see him thinking about possible reasons to offer for her condemnation. Without Cromwell black ingenuity, would Henry have sent her to a convent instead? Sometimes I wonder. I love Mantel’s writing: it’s very tight, not one extra word, words very well chosen. I enjoy the way she translated Cromwell’s cynicism and black cold humor at times. I can’t wait to see now how Mantel is going to portrait Cromwell’s own fall. If you like a good historical novel, extremely well researched and written, you have to read this book. But maybe first read Wolf Hall. Her recent novel The Giant, O’Brien (1998) tells the story of Charles O’Brien who leaves his home in Ireland to make his fortune as a sideshow attraction in London. Her latest books are Giving Up the Ghost: A Memoir (2003), an autobiography in fiction and non-fiction, taking the reader from early childhood through to the discoveries in adulthood that led her to writing; and Learning to Talk: Short Stories (2003). Hilary Mantel’s novel Beyond Black (2005) tells the story of Alison, a Home Counties psychic, and her assistant, Colette. It was shortlisted for a 2006 Commonwealth Writers Prize and for the 2006 Orange Prize for Fiction. 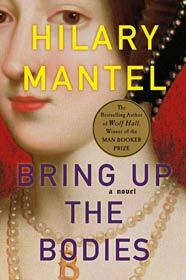 Her latest novel Wolf Hall (2009) won the 2009 Man Booker Prize for Fiction. 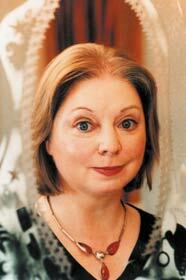 You can find lots of good material on Macmillan website: Hilary Mantel presenting the book herself, and a good reading guide. And another blogger, A Writer Of History, has an excellent interview of the author. This entry was posted in Audiobooks, Historical novels, Reading Challenges and tagged Anne Boleyn, Henry VIII, Hilary Mantel, simon vance, Thomas Cromwell, Wolf Hall by WordsAndPeace. Bookmark the permalink. I’ve been meaning to read Wolf Hall for ages. Simon Vance is a narrator I’ve read nothing but positive things about. Great review. I loved Wolf Hall so I definitely need to pick up this book ASAP! I am glad to hear she clarified who she was talking about in this one because man oh man was I confused in Wolf Hall. Perhaps this will work better for me! I enjoyed your post. I think it must be easier to distinguish the characters listening to the audiobook – it’s a good idea. I’m looking forward to her next book when Cromwell gets his come-uppance! I didn’t like him as much in this second book – in Wolf Hall she drew him much more sympathetically, so it’ll be interesting to see how she portrays him when he falls from favour. Giving Up the Ghost is a fascinating book and I think Beyond Black has autobiographical sections! I recently read A Place of Greater Safety (set in the French Revolution) which is also excellent. I’m a big fan of Simon Vance, glad to hear he did well here. I LOVED Wolf Hall!! My goal is to start/finish Bodies this summer!! Yes, you will love it! As I explained in my review, it is so interesting how Mantel showed more of the complexity of Cromwell’s character in this 2nd volume. Great review! I imagine a good narrator could make Mantel’s Tudor novels really amospheric, and it sounds like Simon Vance does just that! I agree too, about the pleasing differences in Cromwell’s situation and outlook between this and Wolf Hall; Mantel’s writing is seamless, and the transition is deliciously subtle. Looking forward now to last volume! Thanks: the better the book, the easier the review! Can’t wait for vol 3!